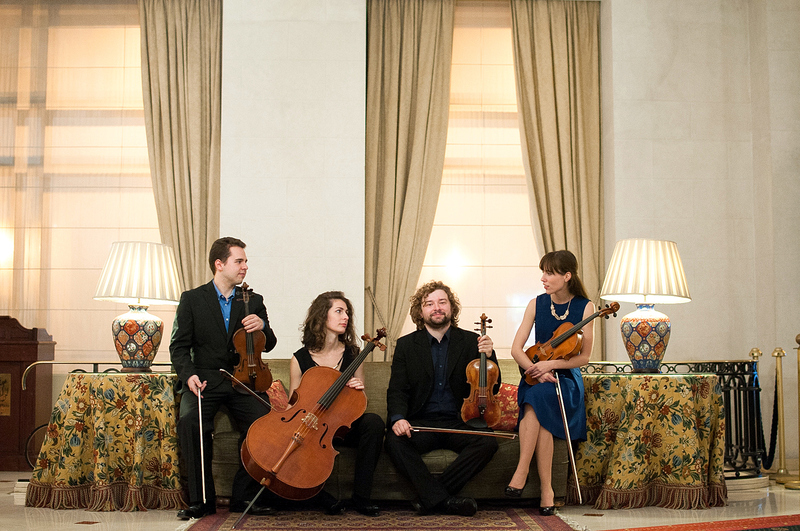 NOX STRING QUARTET was established in September 2014. Musicians met during their studies at the Royal Conservatory of Brussels. To all of them is common one wish: to master the art of quartet playing and to bring on stage composers from romantic, classical and modern periods as well to present rising, contemporary composers. BARTOSZ KORUS, violin – born in Poland. Graduate from Royal conservatory of Brussels (Master in musical performance). Successful orchestra, chamber and solo performer, guest musician at La Monnaie and National Belgium Orchestra. Often invited as a concert master or leader of second violins in various orchestras. He has been invited also to record CDs with musicians all over the Europe. HUGO RANILLA, violin – born in Spain. Graduate from Royal conservatory of Brussels (Master in musical performance), successful orchestra, chamber and solo performer. Currently he has position as a leader of 2nd violins in Brussels philharmonic orchestra (BPhO). TINA ČEH, viola – born in Slovenia. Graduate as a violinist from Royal conservatory of Brussels (Master in musical performance) and in Austria (Bachelor in musical performance and pedagogic). She is orchestra, chamber and solo performer as well the pedagogue. Founder and manager of the quartet. MAÏTÉ LEURIDAN, cello – born in Belgium. Joined the quartet in September 2015. Graduate from conservatories of Brussels and Lausanne (Master in musical performance). She shares her life by teaching and playing in various orchestras and ensembles in Europe. At the age of 18 she received 2nd price at Dexia Classics competition.